Garbageheads On Endless Stun, the latest from New Jersey resident F.M. Cornog (A.K.A. 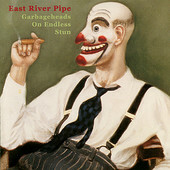 East River Pipe), recorded at his home studio, is a collection of warm, vibrant melodies carried out with a melancholic delivery. Keyboards line the album, giving the album a slower, moody vibe, while Cornog's relaxed singing style gives the impression of both defeat and hope, while his darker lyricism gives the songs a cloudy texture. But even that can't hurt his early morning, rising-out-of-bed melodies, which shine regardless, giving the album a healthy dose of optimism and uplifting beats to make you want to smile. This is a strong record from a home-based musician who doesn't tour; he just makes records. And if he continues to make indie-pop delight records like this with undeniable lo-fi charm, who are we to argue? I'll give it an A-.